I just love the combination of metal with wood. I have used vintage pie tins and old wooden textile spools in our cabin for decor. The pie tins are hung on the rafter beam above the logs in our kitchen and the spools are used as pillar candle holders on our mantle. I had one pan and a couple of textile spools I wasn't using so I decided to make them into a pedestal dish. In order to stabilize the pedestal more I added a round wood base to the bottom of the spool. This piece was another leftover from a glass dome that had been broken. To securely attach the pieces together my husband helped me drill a hole in the center of the wood base the same size as the hole running through the center of the spool. We slid a wood dowel through the spool and into the base using wood glue to secure it. Clamped it for the night and walked away. The next day we drilled a small hole in the center of the pie tin and used a nail to secure it into the wood dowel in the center of the spool. We also added a little more glue between the tin and spool. As you can see, the tin has great graphics and the nailhead barely shows in the middle. ... it could be used as a fruit bowl, candle holder, or add a glass dome to it to use as a dessert stand or make a few in different heights to add some interest to a food buffet at your next party! 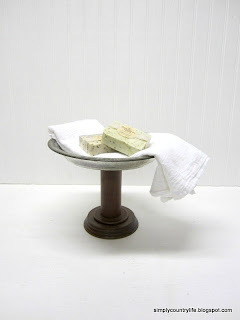 So cute, and I recently made some soaps -- YAY! Hi, I found your project on Debbiedoo's Pinterest party. Just pinned it so I can remember to make one myself. Love it.